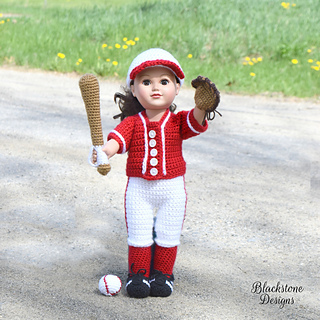 This Baseball / Softball Uniform fits 18” dolls. 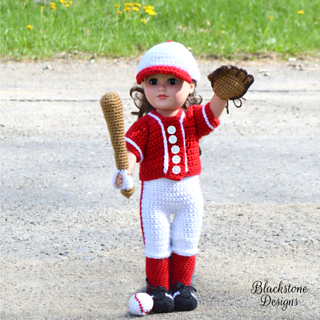 The pattern includes a Jersey, Pants, Socks, Cleats, Hat, Bat, Ball, and Glove. ©2018 Sonya Blackstone. Do not sell, share, or modify this pattern. You may sell items you make with this pattern. This pattern, as with all Blackstone Designs/Sonya Blackstone patterns, are not for educational use without written permission from the designer. Online users please link to me when sharing your creations. Rights Reserved.